The process couldn’t be more simple. First, register your account, and then spread the word that you accept gift cards as donations! Gift Card Tank provides a default page you can use or you can add the form to your web page. 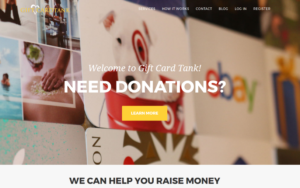 If you are a school, government, or non-profit that needs to raise money consider Gift Card Tank for your next fundraising campaign. Gift Card Tank sounds awesome! I’m going to try them for my non-profit. Thanks for the recommendation!